My understanding of what Shyheels said is that men should be able to wear, visibly in public, long boots (I assume not above knee-high), even if with flat heels. That implies that they can/should be worn over full-length trousers or leggings etc. I would tend to agree; long 'fashion' boots on men should be just as acceptable as those for protective reasons, whether worn outside or inside trousers. Boots reaching above the knee are for separate consideration - but they could also be considered as suitable for male wear, at least in a fashion context, but perhaps with less of a justifiable recent history (quite apart from unavoidable fetish overtones). Any such boots with heels is another matter; heels on any type of 'male' footwear are not generally accepted (as we well know) and boots, of any length or style, are not outside this prohibition, with the obvious exception of cowboy boots, cuban heeled 'Beatle' boots etc. I agree that wearing long boots inside trousers etc may effectively hide them and thus remove the objection. But there is no more point to doing so than there is to wearing high heels almost hidden under extra-long trousers - except to please the wearer whilst not frightening the neighbours. And, if a good reason for long boots is protection against the elements, snakes and other hazards, then putting vulnerable trousers over them is not a very good idea. Isn't a need for a modicum of such protection a valid reason for long boots on men or women - which is why we wear non-fashion wellies in the rain or mud, or functional riding boots? Long boots don't have to be extreme high-fashion to look good and also give that extra protection and warmth that may be needed. In principle, I agree everything, though snakes aren't the only low-level wild-life we all need to care with .... There was a pair of jack-boots seen in From Russia With Love, that had an accessory I would like to see offered in a speciality boot somewhere. If only? In reality (horrible place) how would you wear a man's knee boot? I'm not just asking to be a little 'testy', (devils advocate) but ask because I might consider wearing such a device if I could think of a way for it to be indulged. It's why I suggested 'fashion' (since this can lead to all sorts of abstract ensembles,) including OTK boots with open toes? And I'm not enough of a showman to do it for theatrical reasons. Though maybe when I'm a tad more senile? To wear leg coverings inside a boot, they've got to be fairly close fitting. Quite trendy to wear this style at the moment with treggings/jeggings/leggings being the 'must have' item, so available everywhere. But doesn't wearing them, then remove the prospect of any thermal advantage at a time when a long boot might be justifiable for practical reasons, like keeping warm? I still have some rubber riding boots (leather was too expensive) from the days I used to go to fetish clubs. I could wear those out in the real world, but what with? Jodhpurs? Fairly wearable. There have been times when I would have been very pleased to be wearing the top pair. Around Switzerland/Italy/France in a very wet summer, early 80's. I like the top pair too, although not so high. Funnily enough I aways thought I liked thigh boots but having actually made the plunge into tall boots I find that over-the-knee style is more my thing. And only just over the knee. I can't see myself in tights or jeggings - again, Lycra on my bicycle is as far as I go in that direction - but I wear my suede over-the-knee boots with slim-fit jeans. I like them a lot and it is a look I feel comfortable with. I do not think it looks feminine at all. The only feminine association - and this just a theoretical one - would be simply because women are the ones who wear tall boots, evoking a Pavlovian response in the minds of those who notice. As to styling, there is nothing intrinsically feminine about my boots. Nothing at all. Had I stilettos there would be, or delicate heels, but mine are chunky (2 3/4 inch) or flat. And being suede, which I prefer anyway, there is nothing shiny or suggestive of fetish. They are very understated and classy, really. They are also very practical. I spent a lot of time at my computer either writing or editing/captioning photos and on these cold and rainy late autumn/early winter days they are wonderfully warm and comfortable. I like to work in a fairly chilly room, preferring to put on a jumper rather than turn on the heat (not out of cheapness but because I prefer cool air) and tall, heavy suede boots are a wonderful addition. I'm slightly puzzled by your first question, which I assume relates to a fairly plain knee boot with (at most) a modest cuban heel. If knee-high boots were accepted as ordinary male street fashion, then I could envisage wearing such a boot on any suitable casual occasion where a Chelsea boot or similar would be currently appropriate - the only difference really being in the shaft height. The long boot might be the better choice in adverse weather, although many women see such a style as acceptable even in high summer! I'm not advocating more extreme boot styles (e.g. with significantly high or slender heels, and/or embellishments) for men in any situation where they would not wear (unconcealed) low boots or shoes of a similar style. From what you have said elsewhere, Freddy, you appear to wear various 'feminine' styles (with high heels/pointed toes) in public 'discreetly', so I'm not sure why you would hesitate to wear long boots openly. Is it simply that they are fully-revealed when worn over trousers? To be honest, even if 'plain' knee boots became mainstream male fashion, I would be wary of wearing them, at least 'in company'. My wife would never accept them and would say that they were entirely inappropriate for someone of my age and character - but then she barely accepts my cuban-heeled ankle boots for the same reason. I don't understand the 'thermal advantage' point. If close-fitting leg-coverings and/or long boots are worn, they are obviously likely to be snug and of advantage in cold weather etc. The combined effect may be too much if the weather is milder (think shorts and sandals!) but that doesn't stop the fashion diehards (see above). I'm slightly puzzled by your first question, which I assume relates to a fairly plain knee boot with (at most) a modest cuban heel. If knee-high boots were accepted as ordinary male street fashion, then I could envisage wearing such a boot on any suitable casual occasion where a Chelsea boot or similar would be currently appropriate - the only difference really being in the shaft height. Let's first establish what I mean by a 'knee boot'. Something that comes up to, but probably doesn't cover the knee. So higher than a calf boot, that might completely cover the calf, but sit under a knee. The long boot might be the better choice in adverse weather, although many women see such a style as acceptable even in high summer! Long boots in summer, like OTK/thigh boots with open toes, are fashion attire surely? I'm not advocating more extreme boot styles (e.g. with significantly high or slender heels, and/or embellishments) for men in any situation where they would not wear (unconcealed) low boots or shoes of a similar style. From what you have said elsewhere, Freddy, you appear to wear various 'feminine' styles (with high heels/pointed toes) in public 'discreetly', so I'm not sure why you would hesitate to wear long boots openly. Is it simply that they are fully-revealed when worn over trousers? We may be at 'cross purposes' here. Where I mention wearing a long boot, and how ~ outside leg coverings, I mean a long boot that would be considered a manly/masculine style, not with a heel, and likely not with a pointed toe. Though the two two biker styles I offered as examples, do look a bit 'theatrical' in the "Y.M.C.A." sense of playing 'dress up'. We have all been conditioned, from when we first understood pink for girls, blue for boys .... Dresses for girls, shorts for boys. Close fitting clothing doesn't provide advantage in cooler climes. 'Thermal barriers' are usually made of air pockets filled with fibre or air gaps. A tight fitting legging, or tight fitting trouser offers almost no thermal protection at all, as far as my legs are concerned. When it gets really cold, I will wear hold-ups underneath thermal leggings, underneath loose fitting jeans. Layers, are the way to stay warm. A long boot (or thigh boot in the case of the Y.M.C.A. inspired biker boot) would undoubtedly keep the covered part warmer, because leather and PU are pretty wind proof, even if PU isn't a particularly good insulator. It's the bit above the long (tall) boot that I question. My thinking is, a long (tall) boot might be acceptable for thermal reasons. I'm talking about in winter where a long/tall boot would make sense from the snow or wet or just plain cold, avoidance. No wet trousers or jeans if wearing a long boot. But what to cover the rest of the leg? Tight leggings or treggings/jeggings don't seem like appropriate winter wear, unless you are 18 years old and living in Newcastle? In this respect, jodhpurs don't seem like such a silly suggestion. I would think a man wearing a high riding boot (leather or rubber) and cream/dark coloured jodhpurs would turn very few heads? I wear my suede otk boots with jeans. They are nice and warm and comfortable on cold rainy days. But you are quite right as regards leggings/jeggings etc. They would not have much thermal value. I have several pair of very high quality merino tights for cycling, but even they require something over them - they are not called base layers for nothing. My otk boots are pull-on style and so are much less form fitting than ones with zips. This makes them much easier to wear with jeans. Mrs Freddy has 3 pairs of long boots (as far as I can tell). Her Mars-bar (work/rest/play) boots that have been re-heeled at least once and each boot repaired at least once, from Principles (now gone). A pair she bought as a treat, some Kurt Geiger OTK leather boots at several hundred pounds that very nearly had the upper from a toe-box ripped off one boot, care of a Tesco shopping trolley on their first outing .... And some suede KG OTK boots that get worn when it's bitterly cold outside, because they are so toasty warm, they make her too warm otherwise. Suede would seem a good choice for cooler weather then? So you do wear your boots over jeans, when out and about? Do you get 'looks'? it would be really difficult, I think, to wear pull-on otk boots under jeans. I am sure it could be done But you'd really have to put in an effort. I rarely wear mine out, but that's mainly because I rarely go out myself - unless it is to travel, in which case the places I go are not really suitable for nice suede boots. For example in the next three weeks I will be travelling on assignments in Africa and Central America. When I get home I tend to pull up the drawbridge. When I have gone out I do not know if I get looks as I don't pay that much attention - usually jetlagged or otherwise off in my own little world. or otherwise off in my own little world. I like being around people, but as a watcher really, rather than participator. I'm happy to mix, and be quite the joker come party animal, but I prefer to an observer. It's hard to observe when you are participating, as so much gets missed. When Mrs Freddy, myself and out grandson go out, I will say to either "did you notice ...... ?" "did you see ....?" "do you not think ...... was a bit odd?" Neither of them notice anything. It's so bad, I sometimes accuse Mrs Freddy of needing a white stick. I don't have to say anything these days, just say; "tap tap tap..."
Freddy: I don't think we were/are at cross purposes regarding the style of 'long boots' or their wearability. I too was assuming a 'moderate' male boot up to the knee and of much the style you now illustrate. I can see no objection whatsoever to them - except for the existing convention that men simply do not wear boots much above ankle-high, unless for obvious protective reasons. Rubber wellies - fine; leather wellies (as the good Duke popularised them) - no! I see what you mean about the tight clothing above the boot top being an inefficient insulator; thanks for the clarification. A good reason to wear one's boots crotch-high! Jodhpurs may be the practical companion to knee boots, but I'm not sure that I like the look. If I recall correctly, Ewbank (the boxer) favoured such styles - a right prat he looked too imho. If I recall correctly, Ewbank (the boxer) favoured such styles - a right prat he looked too imho. Such a gift you have for understatement. Did Mr Ewbank not fancy himself as a 'dandy' and a gentleman? I have seen in Selfridges (while shopping for Office boots) and TopShop (while shopping for Office shoes) a tall boot style that might be appropriate. It's a take on the mid 19th century high buttoned boot seen on Army infantry. Nothing I can think of, would persuade me to spend £100+ on a Dune anything BTW. Yes, Ewbank was (and probably still is) a self-styled 'dandy'. I know his house in Hove and, when in the area, saw him occasionally, often dressed in rather foppish clothes which, although 'stylish' were out of place. And he used to drive around the town in a huge US tractor unit (the motive power part of an artic or 'rig') and expect to park it wherever he wished (size permitting). To complete the point, I do not see modest cuban or block heels (say 2.5" max) as out of place on any man's boot, ankle or knee. They are, after all, quite acceptable on Beatle boots and the like - and there are some of those made to a calf height but intended to be worn under trousers. I would not wear the high-buttoned boot - far too fussy - but can agree that it would pass as a man's fashion item. I'm also wary of any footwear with big chunky (cleated) soles; apart from the heaviness, they seem to shout 'I'm straight' just a little too loudly. The second Dune boots are borderline on that basis. But then I wouldn't wear lace-up workboot styles (ankle/calf boots) at all outside the workplace for similar reasons. They are cheap enough to warrant a try, perhaps. As usual with Lidl 'specials', they will either sell out quickly or languish. Of interest, thank you, but nearest store is getting on for 10 miles away. I do shop in Lidl from time to time. Will try this Saturday to buy a pair. Apologies. I had meant to write at the time have a safe journey after I had responded to your comment, but it slipped my mind at the time. I hadn't forgotten altogether though. Possibly a bit late, but the sentiment is there. Come back quickly and fit enough to pull up that drawbridge. I really don't envy you and that journey. Thousands of miles of air travel, many time zones, much pressure and dodgy environments. Sometimes - increasingly often these days, and that's no joke - I think I should have found a more sensible way of earning a living. Back briefly, heading out again Sunday. Some of the places I am going are a bit dodgy, so yes, I will be quite happy to return in one piece and pull up the drawbridge! Shyheels: I too wish you well overseas and look forward to hearing from you on your safe return. They sound similar to a pair of 1917 motorcycle boots I saw and wouldn't mind having, They are exact replicas of those worn by dispatch riders on the front in WWI. Tall, sturdy, lace-up, low heels, sturdy soles. Very useful and good looking, in a classic retro way. I look forward to seeing a picture of the style ..... sometime? As I said, the boots are in the museum at Norwich for all to see - although possibly the displays get altered. As I recall, they were described as thigh-boots and certainly came above the knee, but not to the nurse's crotch (ahem!). To that extent, they would not be the same as the dispatch-rider's style (as I understand it) but I can see the similarity. It's all rather odd. I can find no reference (or rather Google can't) to either styles. They exist, obviously, but no on-line images are readily available. I think neoprene is used in deference to rubber, because it doesn't rot like rubber does if subjected to sunlight. 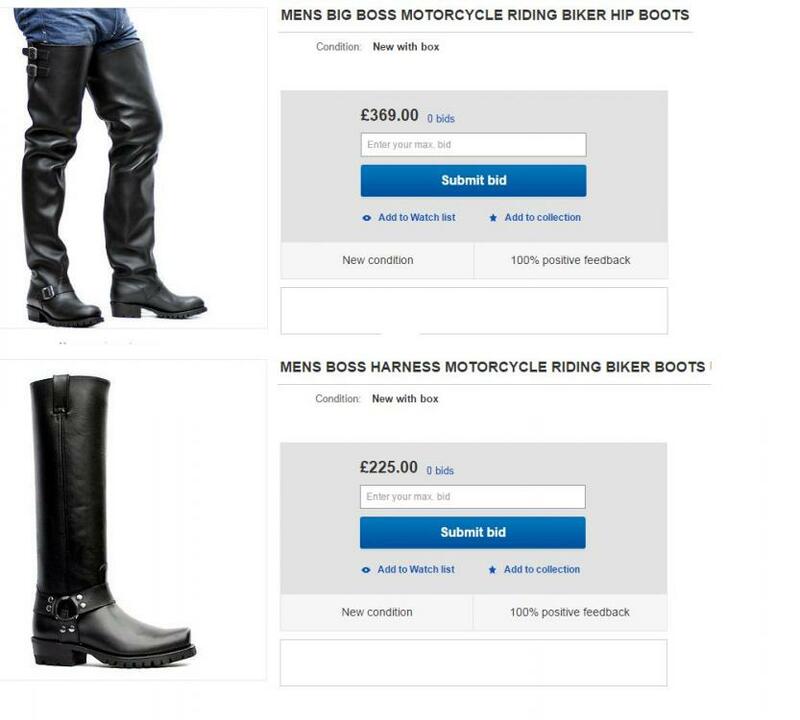 The dispatch riders boots which I mentioned were knee boots - not thigh. I'd like to have a pair - in my case, given some of the places I go for work, they would be quite justifiable! I believe that people on safari in Africa in the golden age of doing such things, back in the 1920s, word thigh-high cloth boots in the evenings in camp to protect their legs from mosquitos and other stinging/biting things.